Last week, I said right here on this blog that using my stove top grill would be enough to get me through to the warm weather, where I could be outside using my actual grill. Just as a snow storm rolled through the area last Wednesday, I found myself with the sudden urge to be grilling again. Unable to resist this primal desire, I busted out the stove top grill, put on a t-shirt and cargo shorts and cooked up my dinner. 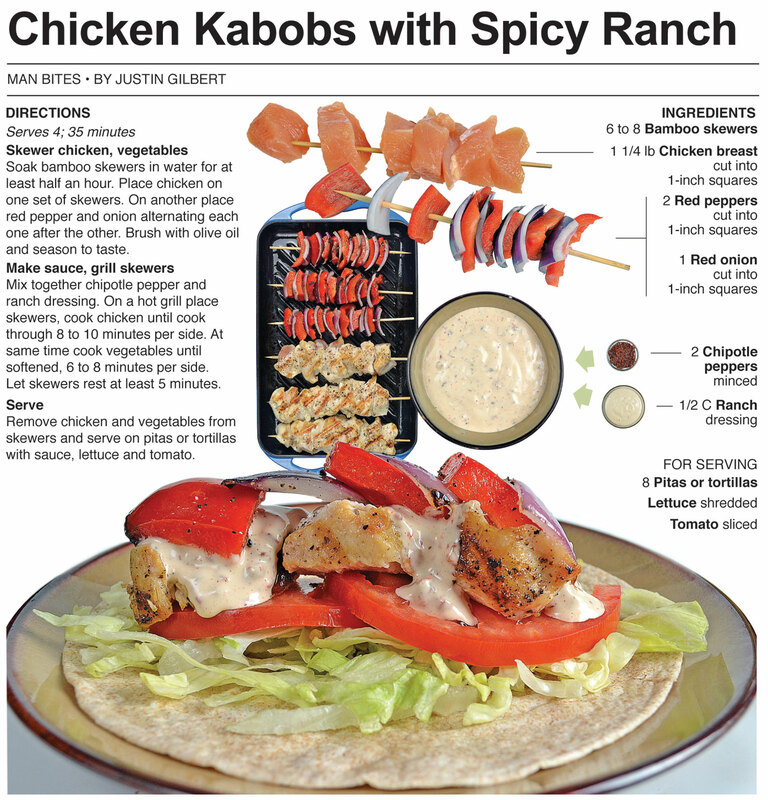 For this recipe, I make chicken kabobs. Instead of putting everything on the same skewers, I separate the chicken from the vegetables. Chicken must be cooked all of the way through and requires more time. Cooking them separately helps avoid over cooking the vegetables. 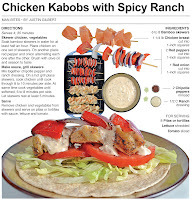 I serve these kabobs in a soft taco with ranch dressing that I spice up by adding minced chipotle peppers. This yummy grilled treat has made it much easier to endure the cold as I wait for warmer spring weather. The irony of this recipe is that another storm (Saturn) rolled through and dropped even more snow in Northern Indiana as it was being published. It was created for the weekly print column, so I made it a week in advance during a completely different weather event. It went to print Tuesday and that night we got hit with the biggest snow of the season. It was enough to have to call in my uncle to plow the driveway - something that hasn’t been needed all winter. I’m hoping it's the last hurrah for old man winter this season. I’m so ready for warm weather, we’re getting close to mid-March so I know that warm temperatures are just around the corner, but I’m like a kid on Christmas Eve trying to fall asleep. I just can’t wait to be outside with a campfire and charcoal grill, it’s my favorite thing about the summers here in rural Indiana. Until then, I guess I'll just hangout in my kitchen wearing flip-flops, cargo shorts and a t-shirt. Soak bamboo skewers in water for at least half an hour. 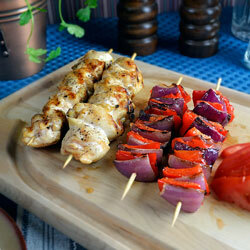 Place chicken on one set of skewers. On another place red pepper and onion alternating each one after the other. Brush with olive oil and season to taste. Mix together chipotle pepper and ranch dressing. 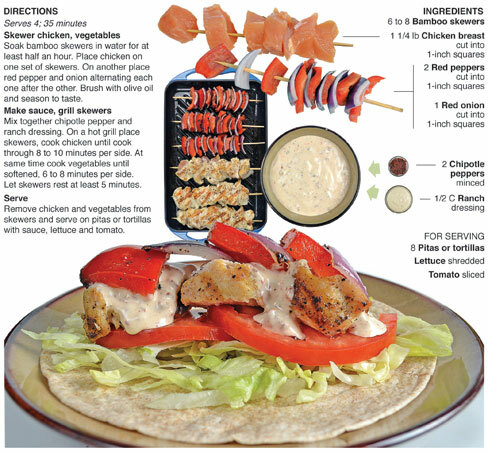 On a hot grill place skewers, cook chicken until cook through 8 to 10 minutes per side. At same time cook vegetables until softened, 6 to 8 minutes per side. Let skewers rest at least 5 minutes. 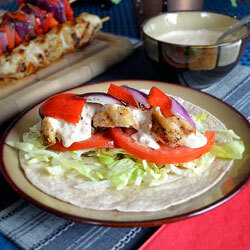 Remove chicken and vegetables from skewers and serve on pitas or tortillas with sauce, lettuce and tomato. These look delicious! Can't wait to try this recipe!!! !